Scooper - Technology News: How can cities improve their climate resilience? How can cities improve their climate resilience? We live in an urbanizing world. Up to two-thirds of the world’s population – some six billion people – may live in cities by 2050 . That’s why cities figured so prominently at the Paris climate conference, where hundreds of mayors pledged to reduce emissions and improve city resilience. As of today, 447 cities have signed on to the Compact of Mayors , a coalition of city leaders who have pledged to reduce greenhouse gas emissions, track progress and prepare for climate change impacts. We codirect the Urban Climate Change Research Network (UCCRN) , a group of over 600 experts who provide climate science information on adaptation and mitigation to urban leaders and practitioners from governments, the private sector, nongovernmental organizations and the community. At the Paris conference, the UCCRN released the Summary for City Leaders of its Second Assessment Report on Climate Change and Cities. On October 29, 2012, Hurricane Sandy hurtled ashore in the New York metropolitan region, killing 44 people and causing US$19 billion in damages in New York City alone. The flood inundation zone in New York City encompassed approximately 88,700 buildings, which contained 300,000 homes and 23,000 businesses , and left two million people without electricity. 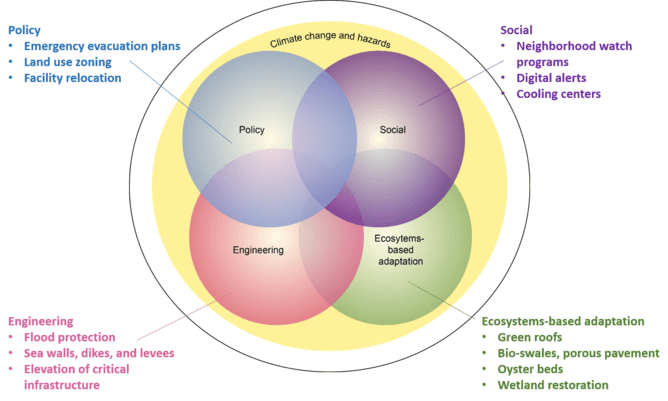 In New York City, the New York Panel on Climate Change (NPCC) , a body of experts first convened by Mayor Bloomberg in 2008, developed a concept of Flexible Adaptation Pathways that the city adopted in its long-term planning. Originally conceived in London, this approach calls for agencies to start adopting resiliency measures immediately, monitor how well they work, and continually update their understanding of climate risk information and responses as the climate system and resilience actions evolve. This caused major failures in the gasoline supply chain, forcing drivers to wait in line at gas stations and limiting New Yorkers' mobility. Fuel shortages also made it more challenging for ambulances to respond to emergencies, for utility workers to restore electricity and for relief workers to reach the hardest-hit areas of the city. The UCCRN recommends that cities should take a portfolio approach to investing in resilience measures that spreads resources across multiple categories. They include implementing citywide policies, such as upgrading building codes; hardening critical protective structures; investing in green infrastructure, such as green roofs and bioswales ; and strengthening social safety nets.